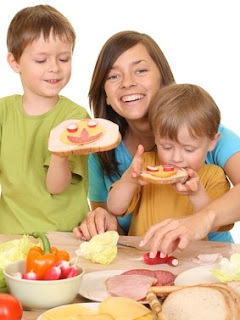 Kids love to snack between their meals and probably like their snacks more than the meals. Now days there are high calories snacks available with low nutrition. Consumption of these snacks has increased obesity in children. One way to stop this is to provide kids low calorie snack recipes for weight loss. These snacks are healthy and more nutritious than the readymade ones. Be innovative and try new snacks at home which your kids will love. 1. Strawberry Banana Smoothie: Take few strawberries and a banana and blend with yogurt and 2 tablespoon of honey. Slowly add low fat milk if you wish. This is a filling and nutritious smoothie! 2. Melon Balls: Scoop out some water melon, cantaloupe and honeydew melon. Arrange these colorful balls in a plate with a toothpick inserted. This makes a very healthy low calorie snack! And the kids will love the colorful balls! 3. Peanut Butter Apple: To make the apple slices more attractive, apply a thin layer of peanut butter to the slices and watch them disappear! 4. Fruit Pops: Blend any fruit or 2-3 fruits and fill the popsicles with this puree. Freeze and serve! 5. Kabobs: Make a colorful selection of fruits and cheese cubes. Cut into small bite sized cubes and skewer them. 6. Oatmeal: Oatmeal is a very healthy snack for kids. Top it with some berries. 7. Ants on a log: Take a celery stalk and apply peanut butter. Put some raisins giving it a look of ants on a log. Kids will love this visually! 8. Mini Sandwiches: Put some boiled egg or tuna in brown bread and cut in mini sizes. 9. Soup: Make any vegetable soup with olive oil! Soups are a great way to get the nutrients and fill the kid's tummy. Serve the soup with a toast. This is a great low calorie kids snack for weight loss! 10. Dip: Kids love to dip. So give them raw fresh veggies with dip made of yogurt or low fat cream. 11. Pita pockets: Cut pita bread into triangles and season with olive oil and some herb. This is a healthy snack! 12. Boiled Egg: This provides the proteins a kid needs. Serve boiled egg without the yolk. Add some salt and pepper. 13. Cracker: Take a cracker and top it with some low fat cheese and olives. You can arrange the olives like eyes and put a tomato for lips. Be innovative to create a healthy low calorie snack recipe. 14. Trail Mix: Mix some bran cereal, nuts and pretzels for a crunchy snack mix. 15. Mini Pizzas: Which kid doesn't love pizzas? Make this low calorie snack recipe and watch your kid enjoy! Take brown bread and cut rounds off the slices with help of cookie cutter. Apply a little sauce and top with chopped green bell pepper and tomatoes and olives. Top with little grated cheese. This pizza can be eaten like this or baked. This healthy kid snack is sure to be a hit! You can invent your kids low calorie snack recipe for weight loss on your own. Be creative with the presentation and watch your kids lose that unhealthy weight!